Our pop up Birthday’s Day cards definitely adds cheer on your friends’ or loved ones’ birthday. 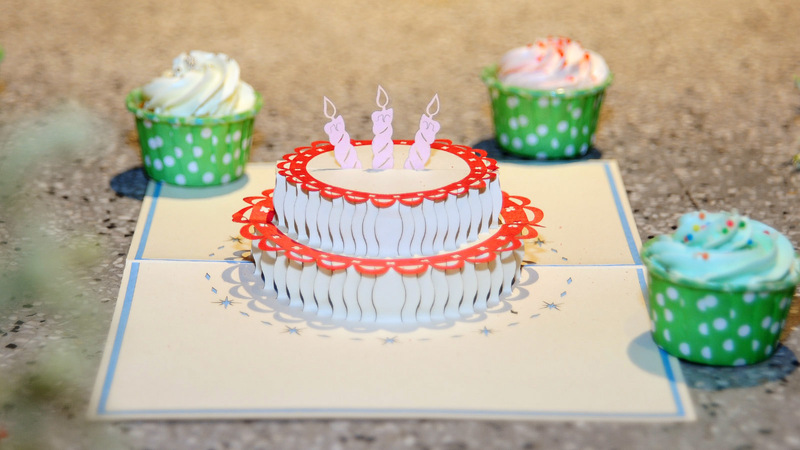 So go ahead and make their birthdays more special by sending our 3D kirigami birthday cakes. Our birthday pop up cards collection will speak your heart out and make their day. CharmPop, as a pop up card manufacturer and Handmade birthday 3D card wholesaler, always give our best to bring the best pop up card ideas into the best 3D card designs! All of our 3D card designs are created with exceptional attention to the smallest detail. Love knows no bounds with pop up Birthday cards from CharmPop. Find the perfect pick for all the loved ones in your life. With this sweet cake theme, CharmPop remenises from the small cupcake your mom makes at home to the fancy big frosting cake just for your birthday. Let someone know you love them more than just a simple wish. Send a 3D handmade love greeting cards expressing your admiration. 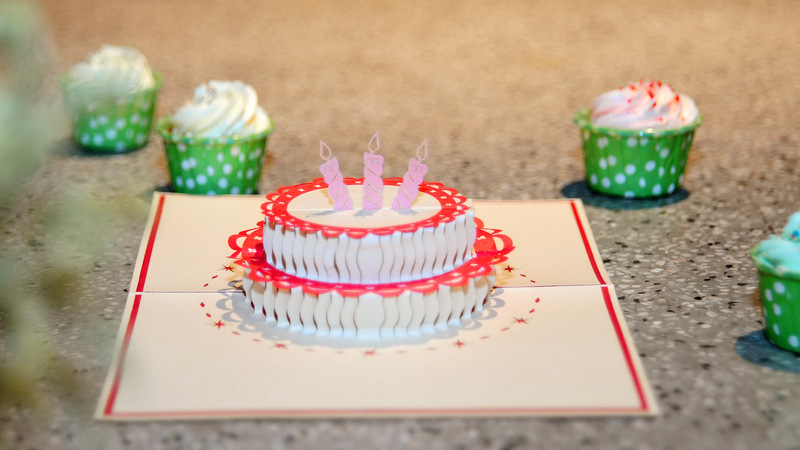 Toast your significant other with a our sweet cakes inspired Kirigami cards. 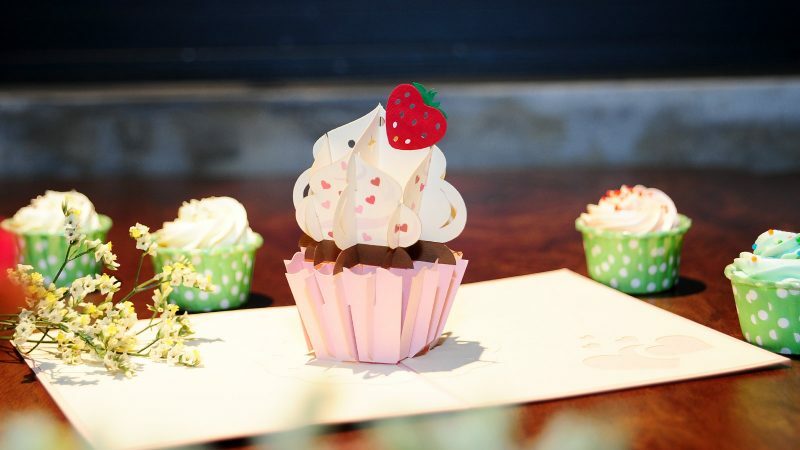 A cute cupcake is a beautiful choice for your loved ones. No matter what flavor frosting or cake, or what ages the recipients, cupcakes are still an all-time love gift. Our craftsmen have carefully design layers and layers of the pop-up to make the sculptures look as yummy as the real cakes. We hope that cute moment will help you feel warm and happy on your birthday. Birthday cupcakes pop up card has a Pink cover that has a cupcake pattern. The image reveals just enough of the literally “Sweet” surprise inside. Open the card and you will find a stunning three-dimensional sculpture of so cute cupcake with colorful sprinkles on top. The card is inspired by a simple birthday party when a girl got her first birthday cupcake from her mother.No matter what flavor frosting or cake, or what ages the recipients, cupcakes are still an all-time favorite birthday gift. Our craftsmen have carefully design layers and layers of the pop-up to make the sculptures look as yummy as the real cakes. We hope that cute moment will help you feel warm and happy on your birthday. 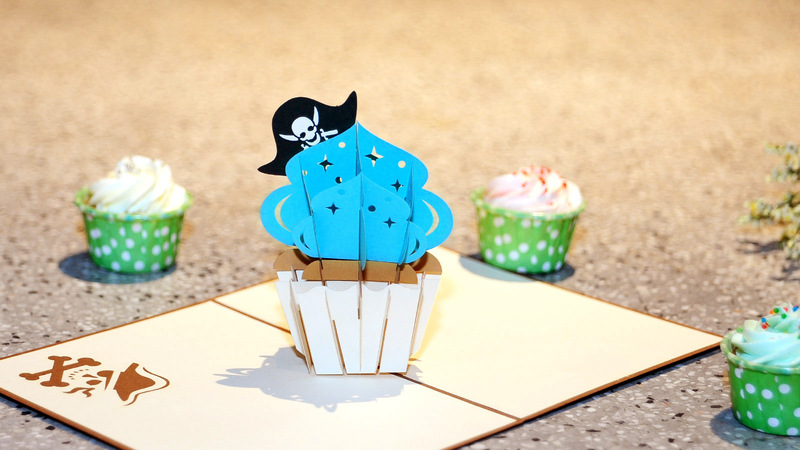 Pirate cupcakes pop up cards have brown covers with cupcake pattern. The image reveals just enough of the cool surprise inside. 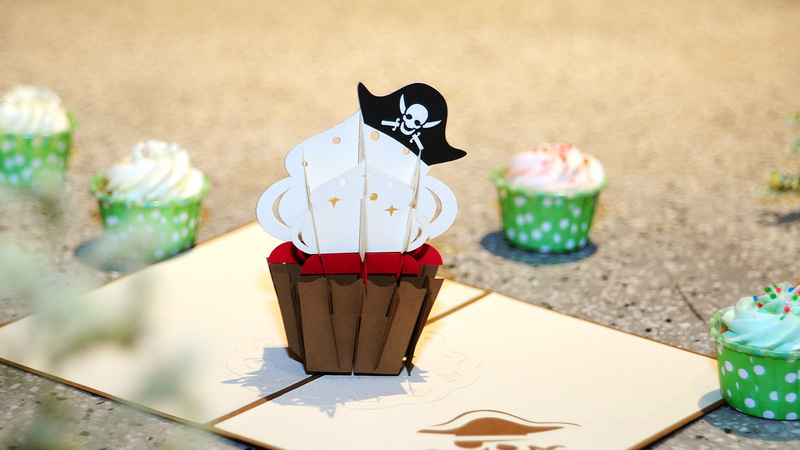 Open the card and you will find a stunning three-dimensional sculpture of an awesome cupcake with pirate decorations. This design is inspired by a simple birthday party of little pirates.No matter what flavor frosting or cake, or what ages the recipients, cupcakes are still an all-time favorite birthday gift. Our craftsmen have carefully design layers and layers of the pop-up to make the sculptures look as yummy as the real cakes. We hope that cute moment will help you feel warm and happy on your birthday. 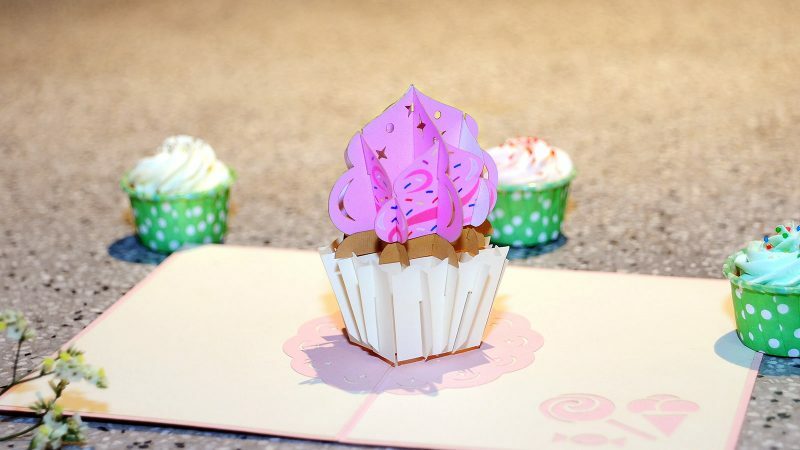 Our Birthday cake pop up card includes two designs of Pink and Blue Birthday cake handmade 3D greeting cards. Both designs features beautiful frostig cake that will sure trigger excitement. You are looking for a Birthday pop up card that goes with every recipient? This set is perfect for you. These greeting card filled with adorable frosting cake illustrations are perfect greeting cards for many occasions. Sending across your sweetest gestures are just about possible with this one. This is now my 1st purchase and I’m still in love with how amazing these cards look. Gonna continue to work with you in the future. Hey Buddy!, I found this information for you: "Pop up Birthday’s Day cards". Here is the website link: https://charmpopcards.com/pop-up-birthday-cake-cards.html. Thank you.